If you’re looking for a showstopper dessert to wow your guests this Christmas, then you’re in the right place! 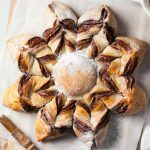 This 5-ingredient vegan nutella snowflake is a real jaw-dropper. If you’re a big fan of 5-ingredient recipes like this one, then you’ll love our debut cookbook So Vegan in 5, which includes over 100 super simple 5-ingredient recipes. Optional: we melt some extra dark chocolate for dipping the snowflake! Preheat the oven to 180°C / 360°F fan-assisted. Mix the flour, yeast and 1 tbsp of icing sugar with a pinch of salt in a large mixing bowl. Create a well in the middle and add 3 tbsp of olive oil and 300ml (10.5 fl.oz) of tepid water. Stir to combine until the dough forms, then transfer the dough to a well-floured work surface and knead for 2 minutes. Then place the dough in a clean and lightly oiled large mixing bowl, cover with a tea towel and leave to prove for 1 hour or until the dough has risen and doubled in size. Meanwhile, transfer the hazelnuts to a baking tray and toast them in the oven for 8 minutes. Then remove the hazelnuts from the oven and turn the oven off. Roll the hazelnuts in a tea towel to remove the skins and add the peeled hazelnuts to a food processor. Blend for a few minutes until you get a smooth hazelnut butter, scraping down the sides as you go. Add the dark chocolate to a metal or glass bowl, then place the bowl over a saucepan containing 2cm (approx. 1 inch) of hot water and bring the water to a gentle simmer on a low heat (make sure the water level isn’t high enough so it’s contact with the bowl). Stir the chocolate occasionally. 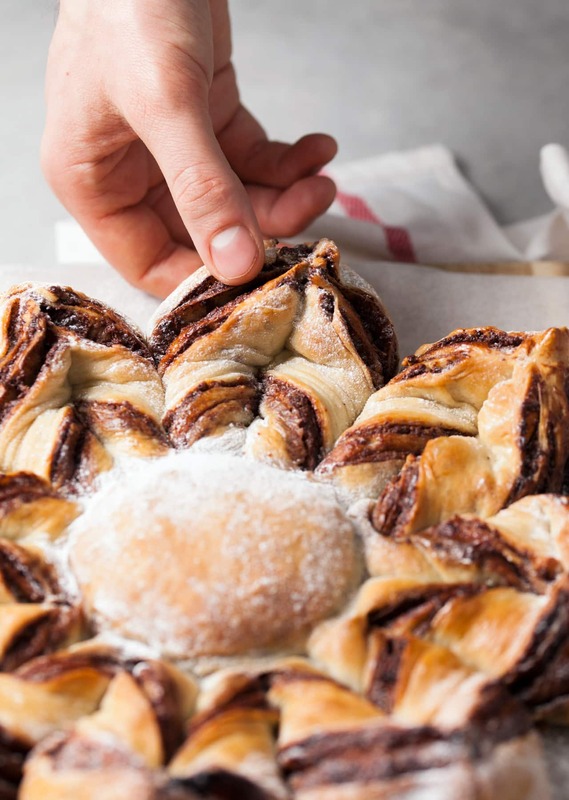 Once it has melted completely (this will take 3-5 minutes), remove the bowl from the heat and add the hazelnut butter and 4 tbsps of icing sugar. Stir until fully combined and smooth like nutella. Lightly punch the dough a few times to remove the air bubbles, then roughly mould it into a ball and cut it into 4 evenly-sized pieces. Take the first quarter and roll it out into a large circle, slightly larger than a dinner plate, flouring the work surface as you go. Transfer the first rolled layer of dough to a large lined baking tray. Spoon a couple of heaped tablespoons of the homemade nutella on top and spread it out evenly. If it’s hard to spread, sit a knife in some hot water then use the warm knife to spread the nutella. Repeat this step for the next two quarters of dough, finishing with the last quarter of dough on top. Place a dinner plate on top of the snowflake and trim the edges to create a circular dough shape, then gently remove the excess dough and the plate. Place a pint glass in the middle of the snowflake then cut the dough into 16 evenly-sized pieces around the glass. To create the twists, take two adjacent sections and twist them towards each other for a full rotation and seal the ends by pressing them together. Repeat until all 16 sections are done. Cover the snowflake with a tea towel and leave to prove for a further 20 minutes. Meanwhile, preheat the oven to 200°C / 390°F fan-assisted. Lightly brush the snowflake with a little olive oil. Bake in the preheated oven for 15 minutes or until golden brown. Then remove the snowflake from the oven and leave it to cool slightly. Create a glaze by mixing 1 tbsp of icing sugar with 1 1/2 tbsp of water and brush it all over the snowflake. To finish, dust the snowflake with icing sugar. Have you seen the Lorraine pascal tweet just. Awfully like your recipe. 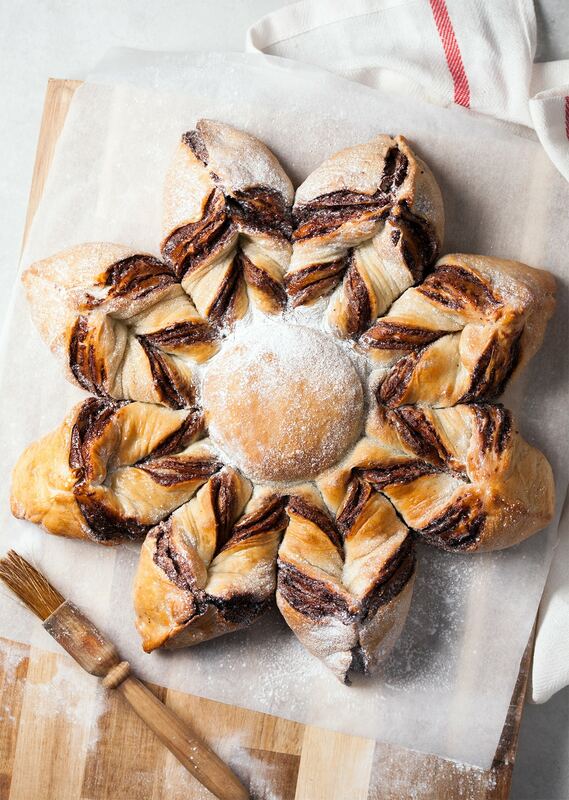 For the Nutella snowflake can we prepare it the night before and bake on the day? How do we store it? Cling film in the fridge?